The repertoire of the Fabergé workshops at its peak represents the ultimate refinement of the goldsmith's art. Each piece was designed with the express purpose of bringing joy to its recipient. Working for the court of Imperial Russia, Fabergé and his craftsmen were able to fashion a wealth of fine objects, some simple, some elaborate, some ingenious, some surprising, but all inventively designed and meticulously executed. For Fabergé, gold was never just gold - it could be red or white green, and there were delightful effects to be had by contrasting the colours. Even the humblest pieces of hardstone --agate, chalcedony and quartz - were transformed into exquisite animal carvings, and their very imperfections were part of the craftsman's inspiration. When Fabergé's creations glitter with precious stones, these are used for their decorative effect, not just for their value. The accomplishments of the Fabergé workshop were not limited to precious metals and lapidary work: their enamelling techniques consistently reached a subtlety and brilliance of technique that had rarely been matched elsewhere - the work glows with richly coloured enamels used with unrivalled virtuosity. With such formidable expertise to draw upon and a clientele including not just the Russian but also European and Far Eastern royal families, Fabergé was not held back by technical or financial limitations: he could give free rein to his imagination. The results included a dazzling succession of masterpieces: carvings of animals and flowers, boxes of every shape and size, jewels, picture frames, automata, scent bottles, ikons, every sort of small decorative object and even one or two pieces of furniture, but above all the Russian Imperial Easter Eggs, which were made for the Tsar to give to the Tsarina on Easter morning. From 1884 to 1917, under Alexander III and Nicholas II, Fabergé and his craftsmen devoted all their skill and ingenuity to these extraordinary productions, each of which embodied a theme or hid a surprise. A. Kenneth Snowman's text represents the distillation of years of experience studying and dealing in Fabergé. Here are new insights into Fabergé's products, his workshops and retail shops, his patrons, customers and collectors. 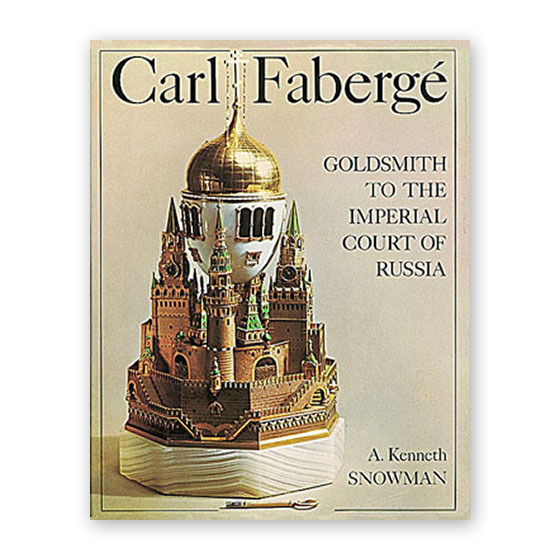 Amongst the previously unexplored aspects Mr. Snowman covers in this book is the building up of great collections of Fabergé pieces.